Rent a Dumpster Near You. Dumpsters can be delivered and picked up in Chicago land and suburbs, including: Berwyn, Bolingbrook, Blue Island, Bloomingdale, Brookfield, Burbank, Calumet City, Carol Stream, Chicago Heights, Cicero, Crest Hill, Darien, Des Plaines, Dolton, Downers Grove, Elk Grove Village, Elmhurst, Frankfort, Frankfort Square, Gooding Grove, Harvey, Homewood, Joliet, La Grange, Lemont, Lincolnwood, Lisle, Lockport, Lombard, Matteson, Maywood, Melrose Park, Midlothian, Mokena, Morton Grove, New Lenox, Naperville, oak Forest, Oak Lawn, Oak Park, Orland Park, Palos Heights, Park Ridge, Plainfield, Romeoville, Roselle, Schaumburg, Stickney, Tinley Park, Warrenville, Westchester, Wheaton, Woodridge and other surrounding cities. Contact us for reliable, efficient and professional dumpster rental service. If your dumpster doesn't have a hinged door and you can't seem to reach over the top of the wall, consider buying a step ladder or creating steps using solid, durable items like concrete blocks! Break down small debris to save space in your dumpster. Put cardboard or styrofoam on the very bottom because they can smash down and free up more space. NO SMOKING NEAR DUMPSTERS! THEY MAY CONTAIN FLAMMABLES SUCH AS WOOD, PAPER OR HAZARDOUS MATERIALS! PREVENT DUMPSTERS FROM SLIPPING DOWN ICY SLOPES BY SPRINKLING ROCK SALT, KITTY LITTER OR SAND. YOU CAN ALSO USE PROTECTIVE BOARDS ON YOUR SURFACE. MAKE SURE YOUR DUMPSTER IS IN WORKING CONDITION! LOOSE HINGES, BROKEN SECTIONS OR RUSTED PARTS CAN POSE A HUGE SAFETY RISK – NOTIFY YOUR DUMPSTER RENTAL COMPANY IMMEDIATELY. 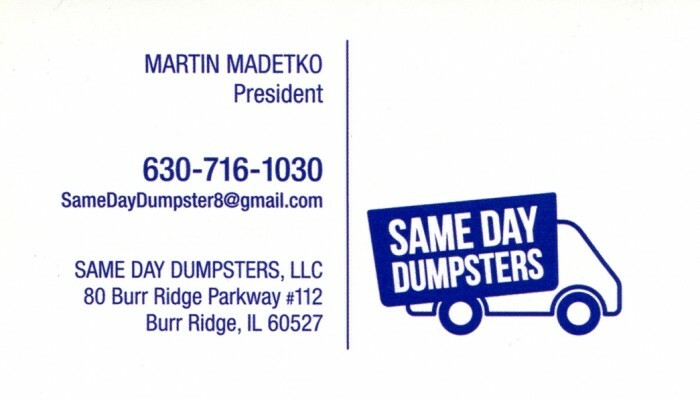 SAME DAY DUMPSTERS IS NOW IN BOLINGBROOK! 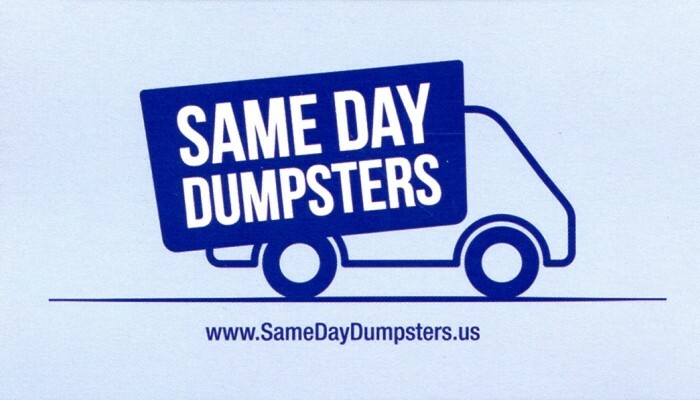 Earlier this month, Same Day Dumpsters offered a sixth location in the Chicagoland area. The idea was to ensure a variety of product and the flexibility to be able to serve the surrounding suburbs with superhero swiftness and efficiency. The new location would better serve the surrounding cities such as Naperville, Woodridge, Plainfield, Romeoville, Lockport, Lisle, Warrenville, Wheaton, Downer’s Grove, Homer Glen, New Lenox and Orland Park areas. SAME DAY DUMPSTERS IS PROUD TO ANNOUNCE A NEW PRODUCT TO OUR LINEUP… 30 YARD DUMPSTER RENTALS! Whether you need a residential, commercial or industrial dumpster rental, our new 30 yard dumpster can handle all of your bigger projects. Call today to find out more information about how our new dumpster rental size can assist you! WHEN YOU CHOOSE A DUMPSTER RENTAL SERVICE, MAKE SURE THEY EXPLAIN THEIR RULES FOR WHAT CAN GO IN A DUMPSTER AND ANY WEIGHT OR OVERFILL LIMITS! IF YOU VIOLATE THESE, YOU COULD BE FACING HUGE PENALTY FEES. Flat Fee Dumpster Rentals Are Usually Better Because You Are Charged One Standard Rate Up Front Instead Of Being Charged By Waste Weight And Other Factors At The End! While it may be tempting to simply toss your old fridges, freezers or air conditioning units into a bin or dumpster, the repercussions of such an action can be fatal. Between the harmful effects on the environment and the devastation it can wreak on the human body, these hazardous materials absolutely MUST be disposed of responsibly. In most cases all it takes is one phone call from you and another individual or organization will do the heavy lifting and take the old appliance off of your hands. HOW TO CHOOSE THE RIGHT COMPANY: HOW LONG CAN YOU KEEP YOUR DUMPSTER? This can potentially have two answers. First and foremost is how long your dumpster rental company is allowing you for your rental period. They should tell you the length of your rental and when you need to consider scheduling your pick up. Second, you should find out from your village or township if they have any limitations on how long a dumpster can be on your property. They may have a much shorter time frame for you to be allowed to use your dumpster. Call your village hall or township office for more details. HOW TO CHOOSE THE RIGHT COMPANY: WHAT CAN YOU PUT IN THAT DUMPSTER? Believe it or not, there is a list of prohibited items that can not be discarded into a dumpster rental. Some dumpster rental companies will take certain items for an extra fee or may make an exception on something. ALWAYS ASK. They can give you more information on what they might take and can provide you with a complete list of prohibited materials. HOW TO CHOOSE THE RIGHT COMPANY: WHAT ABOUT EXTRA FEES AND SCHEDULING A PICK UP? A reputable dumpster rental company should inform you of any extra fees you may be liable for up front. These fees only happen if certain violations occur. Typical Extra Fees: Hazardous Materials – If you put prohibited items into the dumpster such as oils, paints, car batteries, etc. Overfill – If you exceed your dumpster’s weight limit or leave piles of trash around the dumpster that the driver has to load. Extension / Late – If you go beyond your rental period. Trip Charge – If the driver can not pick up the dumpster due to some sort of obstruction. Also known as a “wasted trip”. As far as pick ups, many companies require you to call them and schedule the dumpster to be picked up when you are finished. Some people assume the company will automatically come at the end of their rental period and pick it up. This is often NOT the case and they end up being charged late fees. ALWAYS ask the company prior to starting your rental so you know if scheduling a pick up is your responsibility. HOW TO CHOOSE THE RIGHT COMPANY: DO THEY CHARGE A FLAT FEE? Some companies charge by the ton, which is called Variable Rate pricing. In this circumstance, you don’t know the total until the dumpster is hauled away and the final bill comes. The advantage to this pricing is if you know exactly how much debris you will have. In some circumstances, this ends up to be a cheaper option. Flat Fee pricing is when you are charged one standard fee for the rental and pick up. The advantage to this is that you know the total you will pay beforehand and can adjust your project budget to account for it. By not overfilling your dumpster and staying well within the posted lines and limits printed on your dumpster, you can save even more money. Most people prefer Flat Fee pricing. HOW TO CHOOSE THE RIGHT COMPANY: ARE YOU ABLE TO COMMUNICATE WITH THEM? Establishing a simple line of communication and having great customer service are crucial when renting a dumpster because projects can turn out differently or have variables in play. Having a company that is willing to work with you and make sure all unexpected events are accounted for or handled well make all the difference. Are you able to reach them on the phone? Do they answer your questions promptly and with confidence? Do they keep their promises of delivery times? Do they follow up with you if they need to find out an answer? Are their locations easily accessible? There may be things you can’t experience until you work with them but, in the meantime, you can scroll reviews or customer testimonials online. Don’t be afraid to ask every question you can until you are comfortable. You are the one spending the money. A good dumpster rental company has no problem addressing any and all concerns and with making sure you are completely confident in your decision. HOW TO CHOOSE THE RIGHT COMPANY: WHAT IS THEIR AVAILABILITY? If the dumpster rental company keeps suggesting a 30 yard dumpster for your small landscaping job, they may have run out of product or only specialize in renting large dumpsters. This applies not only to their dumpsters but to the company as well. Can you never reach them or do they never seem to be open when you need them? This is a huge factor to consider if you have an emergency and need assistance immediately or are facing time limits. A well-established company will likely have plenty of resources available to its customers and be ready when you need them. HOW TO CHOOSE THE RIGHT COMPANY: DO THEY HAVE A VARIETY OF PRODUCTS? Some dumpster rental companies only deal with large construction projects and only offer 40 yard dumpsters. If the information for dumpster sizes is not on their website or in their marketing literature, just ask them. Ideally you want to work with a company that can offer you 3 or 4 different sizes in dumpsters so you know that, no matter what kind of project you work on or if your project ends up becoming bigger than you expected, they will have a dumpster for what you need. If you end up calling to ask them, you also have an opportunity to hear how professional they are and how they treat their clients. HOW TO CHOOSE THE RIGHT COMPANY: ARE THEY PROFESSIONAL? How do the business and employees conduct themselves? Are they courteous, polite and willing to answer your questions? How a company and its representatives treat YOU is a huge indicator of what experience you will have working with them. Whether on the phone or in person, you want them to take your project or emergency seriously, be informative and thoroughly answer your questions. HOW LONG CAN YOU KEEP YOUR DUMPSTER? This can potentially have two answers. First and foremost is how long your dumpster rental company is allowing you for your rental period. They should tell you the length of your rental and when you need to consider scheduling your pick up. Second, you should find out from your village or township if they have any limitations on how long a dumpster can be on your property. They may have a much shorter time frame for you to be allowed to use your dumpster. Call your village hall or township office for more details. 5 REASONS YOU SHOULD RENT A DUMPSTER IN WINTER 1. Availability – Most folks wait until nice weather to rent so you will have nearly unlimited availability when you are ready to start your project. 2. Protection – To prevent the dumpster from slipping on icy driveways or moving unsafely, plywood barriers and blocks are put down for added protection. 3. Tarp It – Many people assume that it’s impossible to work on projects during the winter because your dumpster rental can fill with snow. By putting a tarp over the top you can prevent anything but debris from filling your dumpster. 4. Clear The Way – When disposing of debris, make sure the path you take to the dumpster is free of snow. Salt this path so you decrease the likelihood of falls and can access your dumpster rental safely. By doing this you eliminate the reasons why many folks are not likely to rent dumpsters in the winter months. 5. The Pony Express – Bad weather RARELY hinders your local dumpster rental service from dropping off or picking up your dumpster. It would have to be a natural disaster or emergency situation that would hinder your dumpster from arriving at it’s location. Why Do You Need A Dumpster? - ONE - Remodeling or Renovations – If that 1963 avocado green wallpaper in your kitchen or your shag carpeting from the height of disco are starting to grate on your nerves, you might be in need of an upgrade. Whether you decide to upgrade your fixtures or you do an entire room remodel with new drywall and flooring, you will need to dispose of those items in a small dumpster. Why Do You Need A Dumpster? - TWO - Flooding / Emergencies – If your basement floods during torrential storms, your water heater explodes or you end up with a leaking roof, you might find yourself with damaged drywall and personal items. You may need to eliminate water-logged and ruined materials to prevent mold and bacteria from forming. In these cases, it is best to rent a dumpster so those potential hazards can be removed and disposed of quickly and efficiently. Why Do You Need A Dumpster? - THREE - Natural Disasters – Whether it’s a downed tree due to storms or siding destroyed by hail damage, you may need to remove unexpected debris from your property. These types of projects are too large for the average waste management company and require a dumpster. Why Do You Need A Dumpster? - FOUR - Landscaping – When your house looks amazing but the gnarled shrubs and dead trees on your property do not, you might want to completely change your landscaping. It’s not feasible to put all of those twigs, stones, branches and dirt inside your vehicle for removal and waste management will not take dirt or large piles of landscaping debris. Why Do You Need A Dumpster? - FIVE - Prohibited Items - It has been mentioned several times already but your local garbage company can not take just anything. There are quite a few items that they won't haul away for you. In those circumstances, a dumpster can carry all of your debris and most all types of materials. Why Do You Need A Dumpster? SIX - Office Clean Out – Keeping a safe, happy environment for your employees also increases productivity. If your space is cluttered or in need of new equipment and furniture, you can dispose of all those materials in a dumpster rental. Filing cabinets, boxes of old files, furniture, fixtures, garbage and junk can all be hauled away. Why Do You Need A Dumpster? SEVEN - Spring Cleaning / Junk Removal – You may have a tenant that left your property a mess or realize that your attic or garage are packed solid with junk. Spring cleaning and cleaning up rental property are dreaded tasks but being able to eliminate multiple trips to the dump, thrift store or recycling facility can help alleviate that stress. Your local dumpster rental company can even take a container full of recyclables to the appropriate facility if you ask in advance. Why Do You Need A Dumpster? EIGHT - Moving – Anyone that has moved knows the stress of packing up your entire life and shifting it to another location. You have lived and collected items on this journey of existence. Sometimes a move can be made easier by going through all of those old, unused items, getting rid of them and lightening the load. Why Do You Need A Dumpster? NINE - New Additions / Guests – If you have out of town guests coming in or a kid moving back home and you haven’t seen the floor of that guest room in months, you may want to consider a mass clean out. A new bundle of joy may also cause you to clear a space or consider baby-proofing the entire house. If you can’t store large, hazardous items or donate them, you may want to eliminate them completely before the baby comes. Why Do You Need A Dumpster? TEN - Events / Parties - If you throw the biggest shindig on the block every year or you decide to host a community event, consider renting a dumpster. This helps tremendously in post-event clean up. It makes it easier on volunteers and keeps the space free of debris or discarded booth materials and decorations. You might even consider throwing a recycling event in your neighborhood and giving families the opportunity to clear space in their homes and help out the environment. Your dumpster rental company can take the loaded container to an appropriate recycling center. With fast delivery, a variety of dumpster sizes, clean equipment, the utmost care and protection for you and your materials, Same Day Dumpsters has everything you need for your next dumpster rental. With locations in Burr Ridge, Mokena and Elk Grove Village, we are able to access the Chicagoland area quickly and efficiently. Need a Dumpster Today in the Oak Lawn area? Give us a call - We Serve The Oak Lawn area! How Do I Know The Right Size Dumpster For Me? 10 Yrd. - Think a small room renovation like a bathroom or tiny kitchen remodel, a basement/garage clean out or a 15 square roofing job. 15 Yrd. - Think of average renovation jobs, installing new kitchen cabinets, several room clean out, removing a tree and various concrete jobs such as removing a paver patio or repairing a sidewalk. 20 Yrd. - The most popular size for most projects. Full room remodels, whole house clean outs, most roofing jobs (25 -30 squares), deck removals, floor removals and big landscaping jobs. By using our reliable dumpster rental service we can help determine the appropriate size container for your project needs. Perfect and fast service, dumpster arrived right on time. There weren't any hidden fees, taxes or any other shady charges. I will be using them again and highly recommend. Thanks!!! These guys were great! Fast, friendly and the most affordable. They even got the dumpster to me an hour after I called! I can't recommend them enough - truly great service. I will definitely be using them again in the future. These guys were fantastic, same day drop off dumpster and pick up on time. I will totally use them again next time my house is overwhelmed by junks. They were nice and professional, I definitely recommend this company, thank you. Martin is the best. I did my homework and got several estimates and Same Day Dumpster is by far the cheapest that offers the most hands down. Fist off most places offered their dumpsters for 7 days. Same Day 10 days and thats a great benefit, you might not need it for 10 days but those extra 3 days really helped me, also I wasn't sure what size I needed so Martin offered me the 20 yard for the price of a 15 yard, he said if you fill it then I would owe him an extra $50, and I filled it and told him I owe you the $50 because I thought I filled it. He just left from picking it up and I asked him if he wanted a check for the $50 and he said you don't owe me anything that isn't filled, the back is still pretty hollow and this isn't near filled, but I thought it was pretty close and was prepared to give him the extra $50 as we agreed. He could have taken the $50 without me having a clue I didn't really fill it, but he was honest and said no we are good. Who does that? Someone who is honest and trustworthy which is why you would have to be crazy to go anywhere else. First off for a 20 yard dumpster I was quoted over $400 and for a 15 yard best price I had was $325. Plus he offers 3 extra days. Not to mention he said throw anything you want but electronics, while other companies had lists of items not allowed, whats the use of getting a dumpster if you can't throw old paint cans, dry wall etc and have to check if its allowed?.. Don't waste your time with anyone else you will NOT find a better offer. I told him what day I wanted it and early morning it was here. IF I ever need another dumpster or know anyone who does he will be the name I will happily tell people. Great price and fast delivery, they work even on weekends. Easy drop-off and no issue with pick-up. Will definitely use again. These guys are amazing, they saved my life when they delivered a dumpster on the same day. I could not get a dumpster anywhere to do the cleaning in my house after flooding, only they were able to deliver the dumpster so quickly. They are really fast and professional. Great and really fast service, after making a call I received the dumpster in 40 minutes, thanks.